A. Y. Jackson was one of a group of Canadian painters (seven at first) --all highly influenced by the Impressionist movement-- who became Canada's most important art movement. 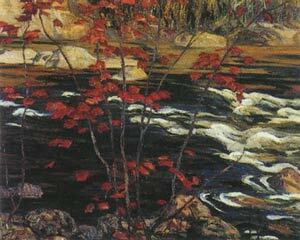 When I was younger, one of the art projects we were given was to reproduce a painting by the Group of Seven. A humbling task, given the talent of these painters, able to suggest a storm, a forest, or a river with just a few flecks of paint. The Group (along with Tom Thompson, who died just before the Group formed) frequently travelled along Georgian Bay and in Algonquin Park, which are in the vicinity of Sweet Marie's neck of the woods. Eventually they moved far afield to British Columbia and Nova Scotia in search of ever more rugged landscapes. Their numbers expanded beyond the original seven and they became the Canadian Group of Painters. Hi again Carley!... Just couldn't resist diving further into your post archives and came across this art post! We indeed share many deeply-held feelings for our Canadian culture and traditions. I too... at a very young age copied "Scarlet Maples" by AY Jackson in my own self-coducted schooling to learn how to paint. It remains an all-time Group favourite of mine! Ironically... in 1972, I discovered the McMichael Collection... while "lost" near Kleinburg. During the several hours of google-eying the paintings of the group... I stumbled upon an elderly... slightly demented AY sitting in his wheelchair soaking up the sun near a window. I was allowed to wheel him about and he personally did the running commentary... one painting at a time. That is another blessing that the Universe offered "Me"... "I" ... am... deeply blessed Carley... and wish "You" a similarly blessed journey!